The previous expression can be thought of as an alternative form of Equation (8.143). As we saw in Section 8.4, the boundary layer equations can be solved exactly when takes the special form . However, in the general case, we must resort to approximation methods. Thus, the tangential velocity profile across the layer is a function of a single parameter, , which is termed the Pohlhausen parameter. The behavior of this profile is illustrated in Figure 8.13. Note that, under normal circumstances, the Pohlhausen parameter must lie in the range . For , the profile is such that for some , which is not possible in a steady-state solution. On the other hand, for , the profile is such that , which implies flow reversal close to the wall. As we have seen, flow reversal is indicative of separation. Indeed, the separation point, , corresponds to . 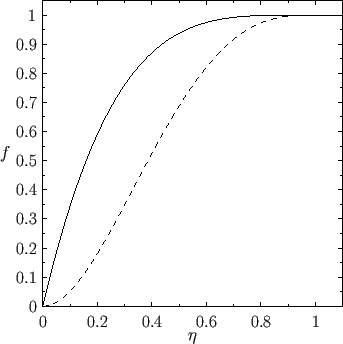 Expression (8.152) is only an approximation, because it satisfies some, but not all, of the boundary conditions satisfied by the true velocity profile. For instance, differentiation of Equation (8.140) with respect to reveals that , which is not the case for expression (8.152). 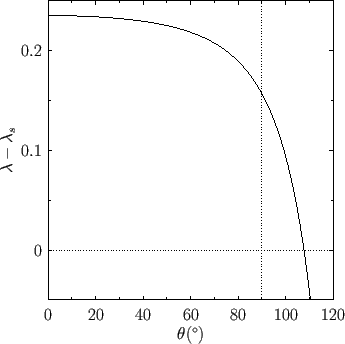 Figure: Pohlhausen velocity profiles for (solid curve) and (dashed curve). It is generally necessary to integrate Equation (8.158) from the stagnation point at the front of the obstacle, through the point of maximum tangential velocity, to the separation point on the back side of the obstacle. At the stagnation point we have and , which implies that . Furthermore, at the point of maximum tangential velocity we have and , which implies that . Finally, as we have already seen, at the separation point, which implies, from Equation (8.161), that . 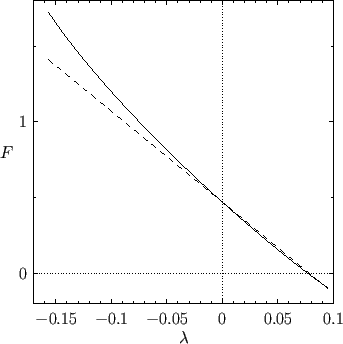 Figure: The function (solid curve) and the linear function (dashed line). Recall that the separation point corresponds to , where . This approximate result compares very favorably with the exact result, (8.73). Figure: The function for flow around a circular cylinder. Figure 8.15 shows determined from the previous formula. It can be seen that when . In other words, the separation point is located from the stagnation point at the front of the cylinder. This suggests that the low pressure wake behind the cylinder is almost as wide as the cylinder itself, and that the associated form drag is comparatively large. Figure 8.16: Flow over the back surface of a semi-infinite wedge. Hence, boundary layer separation can be prevented by making the wedge's angle of dip sufficiently shallow: that is, by streamlining the wedge, which has the effect of reducing the deceleration of the flow on the wedge's back surface. The critical value of (i.e., ) at which separation occurs in our approximate solution is very similar to the critical value of (i.e., ) at which the exact self-similar solutions described in Section 8.4 can no longer be found. This suggests that the absence of self-similar solutions for is related to boundary layer separation.